preparing a plan to separate nuclear activities from the rest of the group. A high-risk issue for the government. Electricite de France (EDF) €33 billion debt, and more problems – its nuclear section to be nationalised. Times 16th April 2019 A row erupted in France yesterday after it emerged that EDF’s board will discuss plans to renationalise the group’s nuclear activities and split them from the rest of its business. Unions reacted with anger to what they depicted as the first step towards the dismantling of the energy group that is building Britain’s new reactors at Hinkley Point in Somerset. The board is due to review the restructuring plan next month before presenting it to senior managers and union representatives in June, according to a source. The scheme involves the creation of a parent company to run the group’s 58 reactors in France, as well as new ones that it may build. This part of the group could be renationalised, rolling back the partial privatisation of EDF in 2004, which left the state with an 83.7 per cent stake. Most of the rest of the group’s activities then would be placed in a subsidiary that would continue to seek private investors under the plan, which has been codenamed Project Hercules, according to the newspaper Le Parisien. Although a source insisted that the restructuring would have no direct impact on Hinkley Point, it is likely to create short-term uncertainty for EDF Energy, the group’s British division. EDF is struggling to meet the cost of renovating its ageing French nuclear fleet, which is estimated at between €55 billion and €75 billion. In addition, the group, which has a debt of €33 billion, is facing several other difficulties, not least that it is committed to funding two thirds of the estimated £22.3 billion cost of the new-generation European pressurised reactors being built at Hinkley Point. A similar reactor at Flamanville in northern France was meant to cost €3 billion and come on stream in 2012. The reactor is still not operating and the budget has reached €10.9 billion. Last week, it emerged that experts had advised that EDF should repair faulty weldings at Flamanville, which would add hundreds of millions of euros to the bill and lead to a further delay. the lack of will to make room for the citizens. Nuclear test victim ordered to repay compensation, https://www.radionz.co.nz/international/pacific-news/385484/nuclear-test-victim-ordered-to-repay-compensation A victim of the French nuclear tests in the South Pacific has been ordered to repay more than $US60,000 paid out in compensation to her.Florence Bourel is a former secretary of the Atomic Energy Commission, who was sent to the weapons test site at Moruroa over a 12-year period. She developed thyroid cancer which in 2002 was recognised as a work-related condition. The test veterans organisation in France reports that in 2008, a court ordered for her to be compensated but the health insurance successfully appealed the decision. A reassessment placed her condition below the disability level eligible for compensation, which she says implies that nothing had ever happened to her. She says out of her pension she has to repay $60,000 and there is no recourse. She also says her daughters have also been affected and one of her grand-daughters had an operation for a radiation-induced disease. IRSN 22nd March 2019 On Wednesday, March 20, 2019, at 10:56 local time, an earthquake of moderate magnitude (between 4.7 and 5.0 on the Richter scale) occurred in Montendre (Charente-Maritime). This earthquake was followed at 11:30 of a magnitude replica of 2.8.
from the epicenter. The Civaux and Golfech power plants are located respectively at 145 and 169 km from the epicenter. The Seismic Risk Assessment Office for Facility Safety (BERSSIN) of IRSN has prepared a briefing note on the characteristics of this earthquake. Les Echos 23rd March 2019 Another place, another atmosphere. Xi Jinping’s visit to France is not expected to lead to any major breakthrough on Orano’s long-awaited contract to build a used nuclear fuel processing and recycling plant in China. Fifteen months after Emmanuel Macron’s visit to Beijing during which the French industrialist and his partner CNNC had concluded a new memorandum of understanding , Orano (the former Areva refocused on the fuel cycle) is still far from to have won the bet. At the time, Orano and CNNC had given themselves until the end of 2018 to formally agree on this mega contract of more than 10 billion dollars. 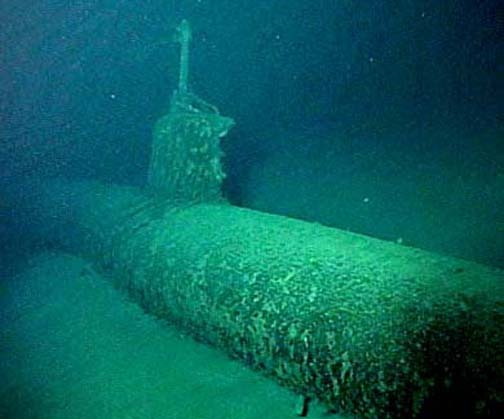 CTY Pisces – Photos of a Japanese midget submarine that was sunk off Pearl Harbor on the day of the attack. There’s a hole at the base of the conning tower where an artillery shell penetrated the hull, sinking the sub and killing the crew. Photos courtesy of Terry Kerby, Hawaii Undersea Research Laboratory. August 2003.
n April 8, K-8 suffered two fires, resulting in a shutdown of both nuclear reactors. The boat surfaced, and Captain Vsevolod Borisovich Bessonov ordered the crew to abandon ship. Eight crew members, trapped in compartments that were either flooded or burned out, died in the initial incident. Fortunately, a Soviet repair vessel arrived, and took K-8 under tow. However, bad weather made the recover operation a difficult prospect. Much of K-8’s crew reboarded the submarine, and for three days fought a life-and-death struggle to save the boat. Although details remain scarce, there apparently was no opportunity to safely remove the four nuclear torpedoes from K-8, and transfer them to the repair ship. approach to saturation, and for some waste there is still no solution. canceled after the nearby nuclear plant contacted the town hall. filed a direct summons against Orano. France Info 1st March 2019 Machine Translation] Cracks, failed welds … How the site of the EPR Flamanville has turned into a fiasco to nearly 11 billion euros. The third generation nuclear reactor, which was to take office in 2012, will finally be operational only in 2020 after the discovery of new defects. Back on those days when the yard slipped. It was to be the flagship of the French nuclear industry, the EPR of Flamanville (Manche) is today its ball. The construction site of the European Pressurized Reactor (EPR) experienced numerous delays, the last of which occurred on July 25, 2018, after the discovery of poorly made welds. Originally scheduled for 2012, its entry into service is (for the moment) postponed to 2020. And nothing says that the yard will be spared by new counter-time. The Nuclear Safety Authority (ASN) thus pinned EDF on Wednesday (February 27th) for a lack of “traceability” of certain equipment qualification operations on the EPR. Michoud, director of facilities at the EPR Flamanville.